Love chocolate and peanut butter together? 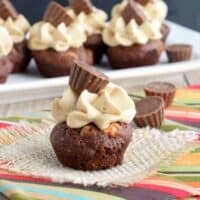 These delicious Peanut Butter Brownie Bites are for you! No really. Grab one!! So hey! It’s Shugary Sweets. You’ve come to the right place! As you can see if you’ve been here before, things are a bit different. Thanks to Lindsay at Purr Design we got a little makeover here! And I’m loving it. What do you think? There are still some kinks to work out, and I’m working on re-formatting some of my recipes to the new design…but overall, it’s totally functional! Let’s walk through a few features, shall we? Recipe List and index: if you see on my top toolbar there is a link for “Recipe List”. Hover over that list and you’ll see a drop down menu of lots of delicious categories. Click on the category you like, and you’ll see I now have a visual index. Popular Posts: On my left sidebar, you’ll see my popular posts all lined up! These update constantly, in case you’re interested. Although, every time I look the Chicken Tetrazzini and Copycat Panera Mac and Cheese are always at the top. Those two posts just keep going crazy on pinterest. Hi there! yep, there I am in a picture. In case you were wondering what I look like. Granted, that picture is a couple years old. I’m definitely older looking now! Savor the Sweet Life! Yeah, that’s my new tagline thanks to Lindsay. She asked me if I had one and to describe my blog. I pretty much said this: “So I love cooking dinner. And, like, savory food, but I also love desserts. Every meal needs to end with, like, something sweet. But on the blog, I probably have 75% sweet and 25% savory. So I don’t know.” She probably thinks I’m not a grown up, cause I talk like a valley girl in my emails. But to my defense I have three daughters….and we lived in the Ohio valley for awhile (that’s what Valley girl means, right??). Back to Lindsay, she took my endless rambling and created a 4 word tagline that describes me and my life and my blog. I heart her for that! I’m working on a new “about me” page. It’s been in the works for about two years. So stay tuned. It may go live before I retire!! And when it does? It will be awesome. “More” tab. This will have a drop down that you can quickly and easily find my round up posts (in case you have a hankering for 100 no bake dessert recipes or 75 chicken dinner ideas)…you’ll also find my monthly Top Ten posts, giveaways, and a new category: FAQ. This one has also been in the works for about 3 years…so it should totally be relevant, right? Less ads on the desktop. In an effort to keep my site fast and running efficiently, I’m going to reduce the number of ads on my desktop. If all goes well (read: income doesn’t drop dramatically), it will stay that way. Hopefully by the end of the month, it will look how it’s supposed to! In the meantime, let’s eat and celebrate with some Peanut Butter Brownie Bites! These delicious, bite sized brownies are loaded with Reese’s peanut butter morsels. 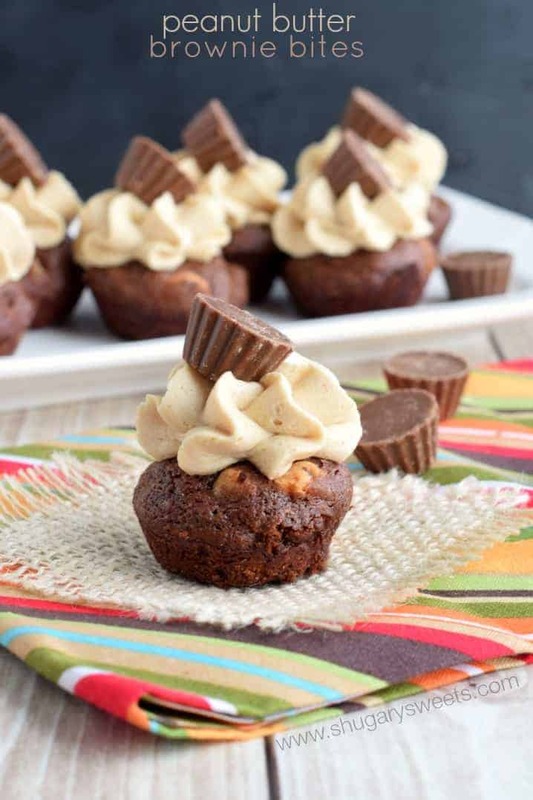 Then topped with a creamy peanut butter frosting and a mini Reese’s. Tell me it’s not too much?! would have been awesome too! Please, poke around my site a little. If you see something acting wonky, let me know! Thanks!! 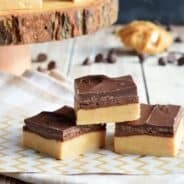 Two bite brownies packed with chocolate and peanut butter. Topped with creamy peanut butter frosting and candy! For the frosting, beat butter and powdered sugar for 3-4 minutes until smooth and fluffy. Bean in milk and peanut butter until creamy and desired consistency. Pipe frosting onto cooled brownies and top with a mini Reese's. Looking for more delicious brownie ideas? Mint Chocolate Chip Brownie Bites: aside from peanut butter, mint is a great pairing with chocolate! Pimp My Brownies: these boxed brownies are out of this world. So much flavor, no one will ever know you started with a mix! 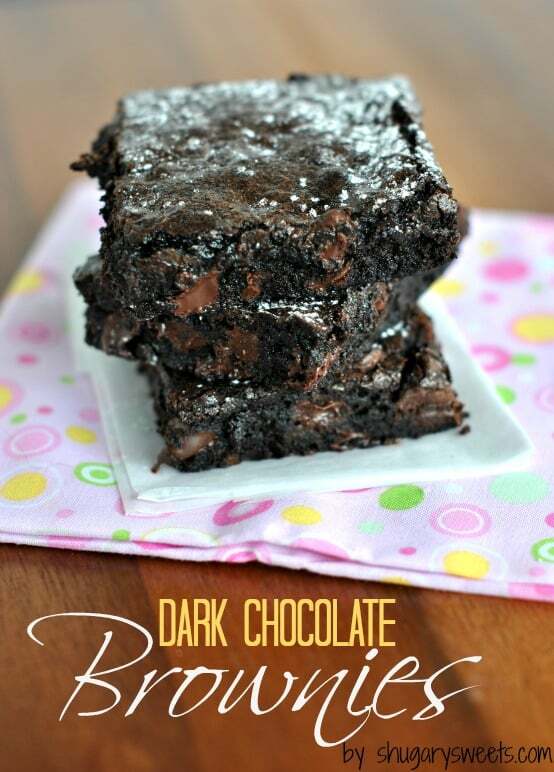 Dark Chocolate Brownies: a classic chocolate brownie recipe that everyone should keep on hand! Ooohh! I love the new design. I love Lindsay’s work. Maybe one day I’ll be at a level where I can have her design my site. These brownie bites are just the thing to celebrate a new look! Now these are the type of bites that I won’t be able to stop eating!!! Killer combo! Love the new site design Aimee! What better way to celebrate a fabulous new look than with these delicious brownie bites! Thank you Eva. I thought awesome brownies would go nicely with an awesome design! Love the do-over that is your blog. I ESPECIALLY love that you will (try) keep the ads to a minimum. I have given up MANY blogs because of all the in-your-face advertising. I realize people want to make a little money, but if you want the traffic, you have to give the people what they want as well, which mean no/minimal ads. As for today’s recipe… YUM!!! Anything peanut butter is a hit with me and the fact that it also includes peanut butter frosting!?! I’m in heaven! Thanks! How funny that I messaged you on Wednesday about your site and now look…GORGEOUS! It looks great Aimee. So light, fresh and pretty! Love purr’s designs! Can’t wait to see all the new additions. I’ll be looking around! 😉 Oh yea can’t forget the food. 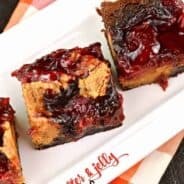 These brownies bites look to die for! Love how small and cute they are. Perfect for grabbing and go. Can I eat 3 and it only count as 1? 🙂 Pinned! I love the site Aimee!! It is so pretty! 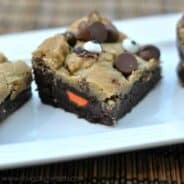 And these brownies bites, I need a few of these! 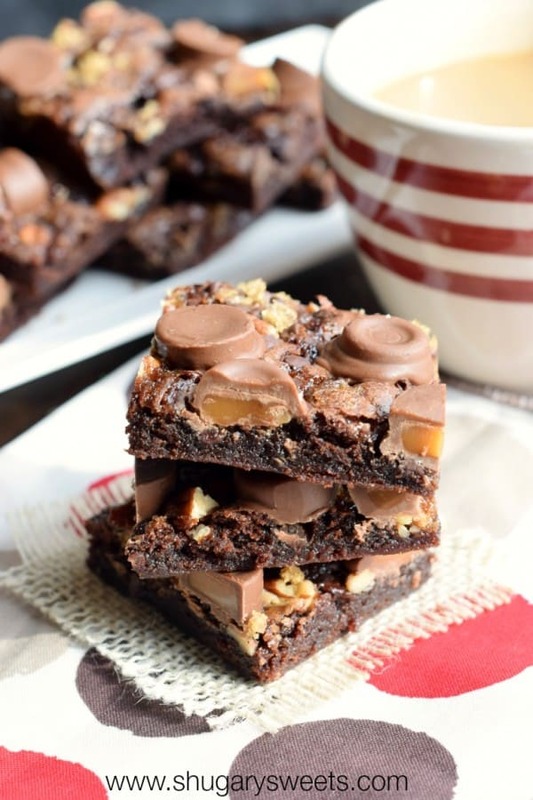 These may just be my all time favorite sweet – Reese’s peanut butter cup + brownies – YUM!! I love love love the new look!!! It’s so fresh, clean, and fun!!! And peanut butter brownie bites? How could I not love those too!!! I’ll take 6 please!!! Wow, I LOVE the new design – so fun with all the pink! Aimee this is so beautiful!!!! I love the look sooooooo much!!!! Yeah…I can’t stop visiting my own site, haha!! I love the the large piping of frosting on each bite, just how I like it!! You site is looking so pretty Aimee! I’m sure you are thrilled! Can’t wait to see all the new features too! I love love love the new site!! Gorgeous Aimee!!! Lindsay is amazing. This is an absolutely gorgeous redesign Aimee! Your site looks really wonderful. I love the pink! 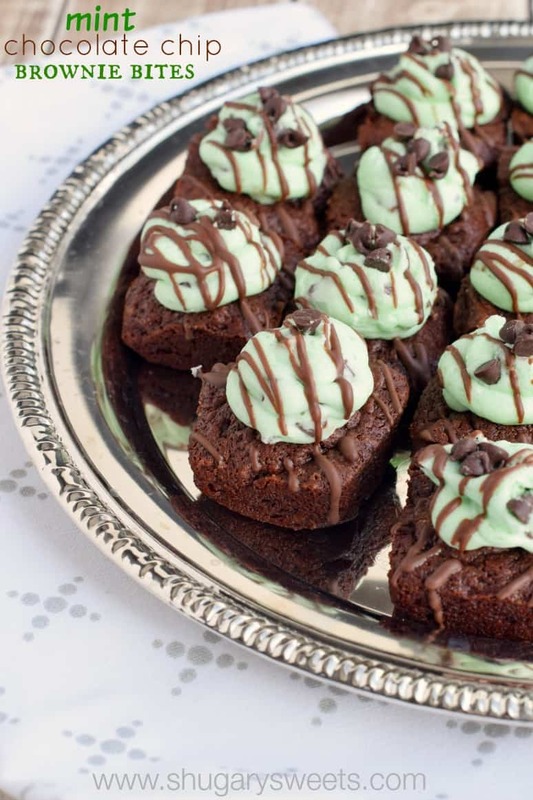 And these brownie bites are the perfect way to celebrate! I LOVE your new site design! I think it is fantastic and your tagline fits your site perfectly! Wow, the site looks fabulous! I love the popular posts on the side, so nice and clean and BEAUTIFUL! Also the brownies are right up my alley! Wow! I love the new look! It’s so you. And those brownies are pretty awesome too! Congrats on the redesign. It’s tres gorgeous. And speaking of “tres gorgeous”… these brownie bites.. Mmmmmm. 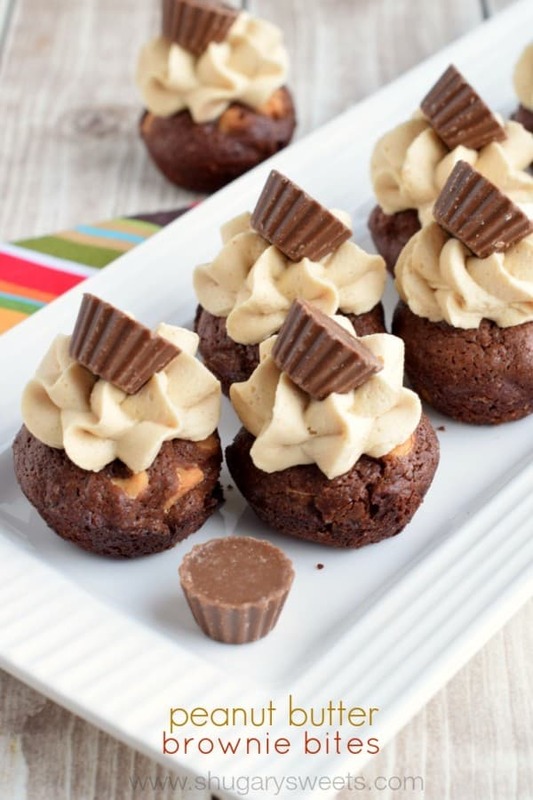 I will have to make these for my fiance, who is all about anything chocolate-peanut-butter. YUM. LOVE the new look, Aimee! I’m a big fan of these brownie bites, too. You can do no wrong! It’s so pretty Aimee! I love it and the tagline sums it up perfectly. You do peanut butter and chocolate oh so right! These are so fantastic! 2-omg these are like my perfect treat! love love love these peanut buttery brownie bites! There’s not much chocolate and peanut butter can’t fix, especially when its in brownie form! I love these little bites Aimee! I LOVE the new blog design Aimee!! I love how it is different than a lot of blogs with your name verticle on the left. So cute! Hi Aimee – I made these today as the weather is awful outside and I have been craving these since I saw the post. I have to tell you, these turned out to be a delicious disaster! I couldn’t get a single one of them to come out of the muffin pan in one piece, so, they were still warm enough that I crushed and pressed them all into a 7×11 glass pan and let them cool and then made the frosting and topped it off with about 15 small Reece’s Peanut Butter Cups all chopped up and sprinkled around on the top. They came out very good and satisfied the craving. That peanut butter frosting is REALLY good! Thanks for aiding and abetting! haha, delicious disaster! I love it! I use Pampered Chef mini muffin tins, and they are fantastic. I don’t even have to spray them! So happy to hear your found a solution though, and I agree…that frosting. OMG! Peanut butter and chocolate together? These are just wow! And you’re brownies are just deliciously amazing! And by the way, I like your blog design.